Lansing, MI, February 16, 2009 – Magic Vac, a custom thermoformer in Salt Lake City, Utah, has a few major customers who build enclosed cargo trailers, which require leading-edge roof caps. In the past few years, owner-manager Larry Wilkins has introduced his customers to the cost, performance and appearance benefits of making those trailer caps from thermoformed plastic rather than fiberglass. Today the materials of choice for Magic Vac’s customers are two thermoplastic polyolefins (TPOs) from LyondellBasell. At the time Wilkins first proposed using plastic in these applications, Magic Vac was the largest former in the world of thermoplastic truck canopies — camper shells and full covers for pickup trucks. With competitors making these parts in fiberglass, the company was aware of the fading, chalking and crazing that can degrade the appearance of fiberglass canopies over time. Magic Vac initially persuaded users of fiberglass trailer caps to switch to thermoformed ABS, in order to address appearance issues and to provide cost reductions as well. As Wilkins explains, "The advantage of any plastic over fiberglass is in production labor costs. And in the case of trailer caps, fiberglass parts are also more difficult to install." While thermoformed ABS delivered immediate cost and long-term appearance benefits, the shortcomings of the material began to appear after the second winter parts had been in the field. "ABS is notch sensitive, with a tendency to propagate cracks caused by stress," says Wilkins. "Over time these parts would start to crack, and cold weather just made it worse. Rising warranty costs were threatening the production savings." After demonstrating the crack resistance of TPOs to his customers, Wilkins now supplies trailer caps made from sheets of Sequel E3000 polyolefin, co-extruded with a high-gloss cap layer of Indure 1500HG TPO. Produced by LyondellBasell, both materials are used in sheet extrusion and thermoforming. The sheetstock is supplied to Magic Vac by two extruders, Primex Plastics and the Spartech Corporation. Magic Vac now makes caps in two colors for five different cargo-trailer manufacturing facilities in the central and western United States. Black caps feature a black substrate of Sequel E3000 material with a black cap layer of high-gloss Indure polyolefin. For white caps, both materials in the co-extruded sheet are white. "Our customers love the material," says Wilkins. "The gloss is higher than ABS, approaching the best of fiberglass. And it will retain that high-gloss appearance much longer than fiberglass will." The transition to TPO has significantly reduced warranty costs associated with ABS parts. Wilkins has "not, to this day, heard of a failure in the field, related to stress cracking, on one of our TPO caps. The polyolefin material may cost a little more than ABS," he adds, "but the savings on the warranty end more than make up the difference. 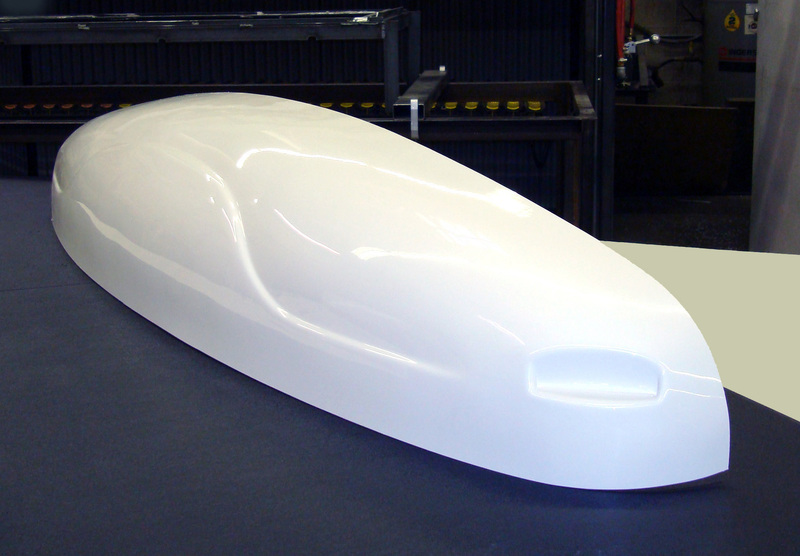 And the total part cost for our customer is only about 60% of what it would be in fiberglass." "Larry Wilkins is among the growing number of thermoformers who are discovering the value of working with Sequel and Indure polyolefins," says Roger Jean, Senior Market Development Manager at LyondellBasell. Magic Vac has built a new oven that is dedicated to forming TPO parts. The new equipment provides the even heat required for these materials, and it features separately controlled top and bottom heat, with zones at the outer edges for end-to-end and side-to-side temperature control. Wilkins has also invested time and manpower in refining his technique for forming TPO sheetstock. "We recycled a lot of unacceptable parts while we were learning," he says, "but now our reject rates are basically the same for TPO as for ABS. The technique is different, but it’s not impossible. And the support we had from LyondellBasell throughout the process was second to none. We worked closely with LyondellBasell experts, who helped us master the process." In addition to having one line dedicated to TPO production, Magic Vac has partnered with Superior Fiberglass, a quality tool maker in Salt Lake City to introduce ceramic tooling technology into its process. Using a ceramic tool surface on a fiberglass support structure produces good quality parts without the expense of traditional aluminum tooling. Now that Magic Vac is equipped and experienced in forming TPO, the company hopes to introduce its own design for a generic cargo-trailer front cap that can be used by trailer manufacturers who might not find it economical to purchase custom tooling and parts. "Sizes are pretty much standard in this industry, with trailer widths from four feet to 100 inches,’ notes Wilkins. "The flexibility of TPO will allow for minor variations in size and configuration. And the combination of the ceramic tooling and the Sequel and Indure polyolefin materials should allow us to offer a line of economical parts to manufacturers throughout the United States." Sequel and Indure are trademarks owned or used by LyondellBasell group companies. The Sequel and Indure trademarks are registered in the United States Patent and Trademark Office. Photo Caption: Magic Vac, a thermoformer in Salt Lake City, Utah, produces leading-edge roof caps for cargo trailers using thermoplastic polyolefin (TPO) materials from LyondellBasell Advanced Polyolefins. 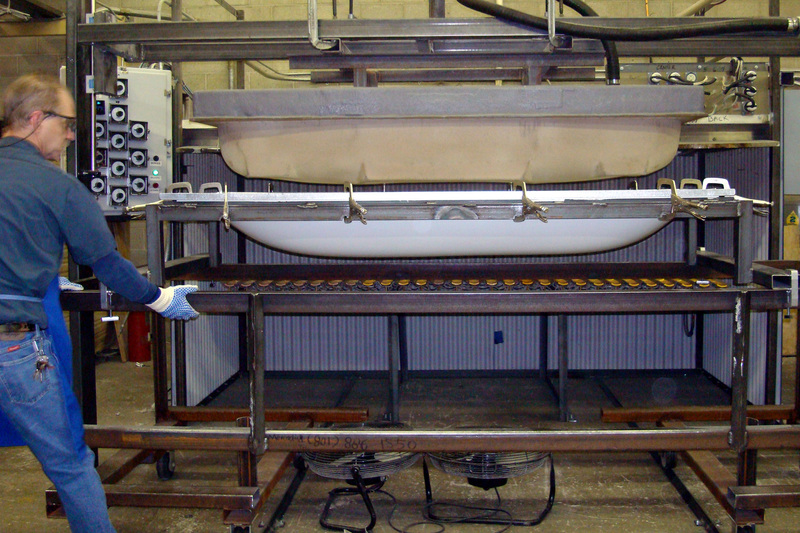 Here an employee positions a heated sheet of TPO beneath a ceramic tool prior to forming. Owner-manager Larry Wilkins built an oven specifically to handle these materials because of the benefits offered by the resulting parts. "We use co-extruded sheet, with a substrate of Sequel E3000 TPO and a high-gloss cap layer of Sequel E1500HG polyolefin," says Wilkins. "Our customers don’t have issues with surface crazing or chalking that can be common with fiberglass caps, and the TPO has better low-temperature durability than some alternative plastics, such as ABS." Photo Caption: Leading-edge roof cap produced by Magic Vac, using sheetstock co-extruded from thermoplastic polyolefin (TPO). The company offers caps in black or white. Caps are formed using cost-effective ceramic tooling.